Trident Booksellers on Newbury Street has renovated after being damaged by fire. 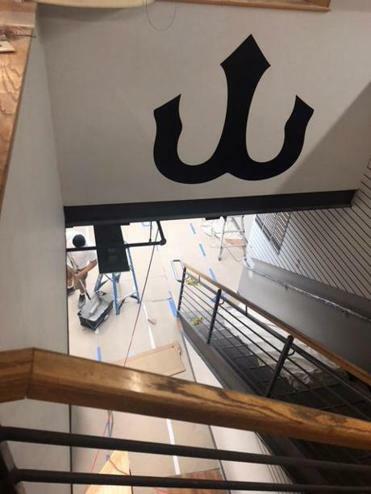 Trident Booksellers and Cafe is planning a reopening in mid- to late-August, about six months after the Newbury Street store suffered extensive water damage from sprinklers triggered by a fire. The whole place is in the process of being redone, explains store manager Courtney Flynn. New floors, new bar, new paint, new lights, not to mention the re-ordering of 25,000 titles to fill the shelves. “For the most part, it’s going to feel similar” to the way the store was, Flynn explains, but customers will notice some changes. Some booths in the cafe will be moved to allow access to a window that had been previously blocked by bookshelves. Perhaps the biggest difference involves moving the children’s books upstairs so there will be a whole section devoted to kids. The store is also planning to ramp up events programming, with something taking place every night of the week. Before the closing, events were largely confined to Monday through Friday. “Tons of author events,” says Flynn, as well as trivia nights, Lego nights, and murder mystery events. It’s “impossible to imagine post-1960s American culture without Manson and the family somewhere near the center,” argues Cambridge resident and UMass Boston professor Jeffrey Melnick in his new book “Creepy Crawling: Charles Manson and the Many Lives of America’s Most Infamous Family’’ (Arcade). The book veers from the stacks of volumes of true crime writing on Manson and serves more as cultural history. Melnick details Manson’s impact on life in the latter half of the 20th century and beyond; he explores who Manson’s “girls” were and how the family system was organized, as well as the Tate-LaBianca murders and how Manson moved in the “fluid social order” of 1960s Los Angeles. Hippies, freaks, insiders, outsiders, rock stars, and suburbanites feature in the book, and it tells us as much about ourselves as it does about Manson. Nina MacLaughlin, author of “Hammer Head: The Making of a Carpenter, ” can be reached at nmaclaughlin@gmail.com.